Based on eight years of interviews in Kabul, Washington, and New York, Your Country, Our War: The Press and Diplomacy in Afghanistan demonstrates how news has intersected with international politics during the War in Afghanistan and shows the global power and reach of the U.S. news media, especially within the context of the post-9/11 era. 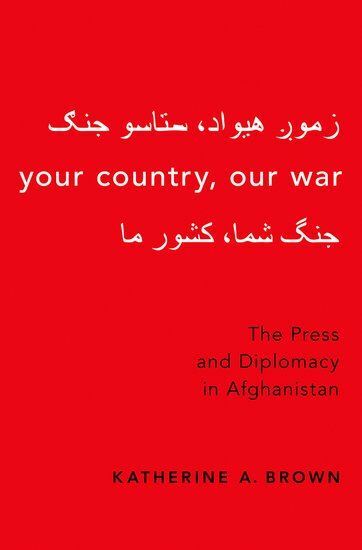 It examines how U.S. journalists affected the U.S.-Afghan relationship and chronicles their contribution to the rapid development of a community of Afghan journalists who grappled daily with how to define themselves and their country during a tumultuous transition from fundamentalist to democratic rule. Dr. Katherine Brown is the President and CEO of Global Ties U.S. and an Adjunct Assistant Professor at Georgetown University's Security Studies Program. She began her career in the National Security Council at the White House and first traveled to Afghanistan in 2003 as a U.S. embassy press aide, to return several times over 13 years. From 2013 to 2016, Katherine served as Executive Director of the U.S. Advisory Commission on Public Diplomacy, an office authorized by Congress to strengthen U.S. engagement with foreign citizens. As President of Global Ties U.S., Dr. Brown will also speak about WorldBoston's Citizen Diplomacy Program.